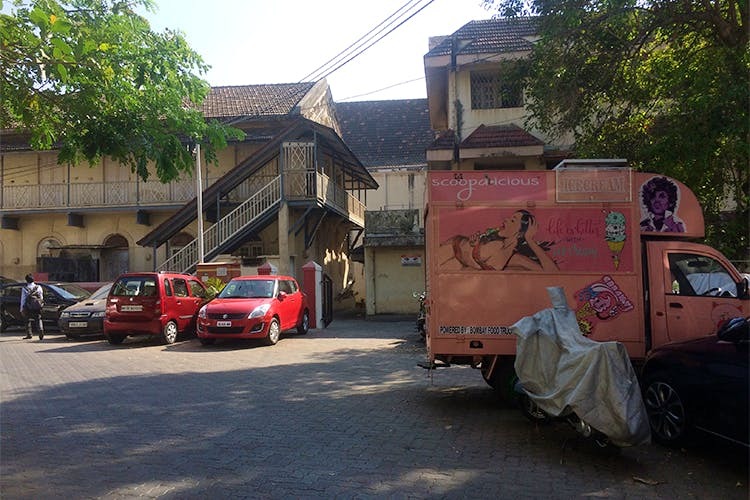 We take a walk down Chimbai village – one of the oldest settlements in the good old Bandra and explore its gems, old and new. With its existence dating back to about 400 years, Chimbai is a fishing village inhabited by the Kolis. It was one of the most coveted beaches in Bandra at one point but now the coast lays littered, sadly. Chimbai still doesn’t disappoint, though. It’s a charming little lane extending a sense of comfort with its shops (small and big) and eateries that don’t let you pass by hungry.As you dwell on the quirky messages put out by St. Andrew’s Church on Hill Road, Chimbai Road quietly peaks from behind. As you ignore the traffic on the posh St. Paul’s road, Chimbai is laid back and is a one-way street to calm. With the sea breeze in tow, The Village Shop lures you with ‘organic’ as a keyword, painted on its white tiles followed by On My Own, a strict but charming indie competitor to Fab India, selling ethnic wear (kurtas start at INR 1000, jewellery INR 350).Walk a little ahead and you’ll come across a small stall on your right selling Maharashtrian snacks and a home cook who bravely puts out a Biryani notice chalked on a blackboard. This is Chimbai for you, unpretentious and simple.Big burger joint Frisbees also calls Chimbai home (not on a Monday, though). One must try their jerk chicken burger along with their herbed fries to completely induce a food coma. Just beside Frisbees is your neighbourhood Chinese joint in Green Chili, serving yummy Chinese to satiate those cravings that hit often. And if you wish to indulge in a Mughlai treat, please do visit the biryani and kebab counter a little up ahead of Frisbees. The fun lies in taking a closer look at tiny stalls that sell everything from dried fish to papaya pickle. Even with high rises lining the beach, Chimbai retains the old world charm with the fishermen’s traditional, old school houses on the shore. They still have a sense of community living which is a fresh change from all the individualism this city throws at you. If you’re there, do stop by the friendly fisherwomen selling fresh catch every morning.